Photo 1. 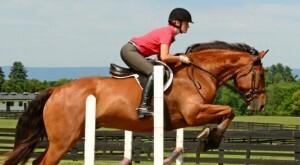 Gripping with the toes prevents this rider’s heel from sinking. Do you tense your feet or curl your toes when riding? Do you feel more pressure on the outside edge of your foot? Are you unstable especially when jumping? 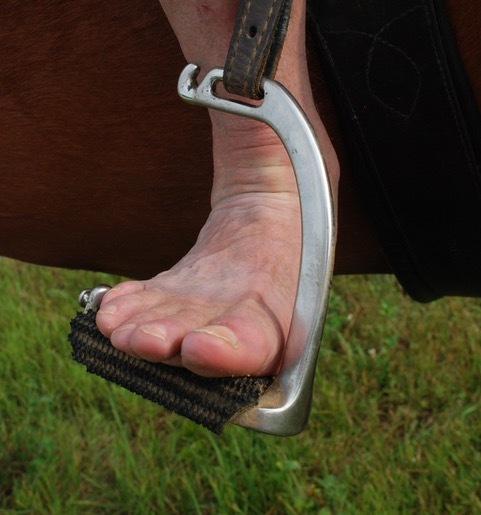 Here’s a quick tip to spread your base of support over your entire foot to feel more secure in the saddle. Your boots tell a story if you look at them closely. Holes or shiney wear marks on the pinky toe side, leather stretched past the edge of the sole, deep creases across the toe box, or stretch marks over the toes tell you that your feet are not flat in your boots when you ride. Under saddle notice what you do with your feet in your boots. Are your toes curled or crunched? 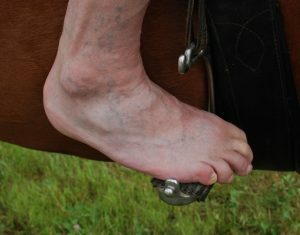 Do you roll your foot to the outside or jam it against one stirrup branch? Does your ankle lack movement? Do you have difficulty getting weight into your heels? Only a flat foot position, like standing on the ground, will allow your weight to properly sink into your heels. Photo 2. Rolling to the outside of the foot raises the heel and strains the ankle. To understand the function of your foot think of dividing it into two parts, a weight bearing and the stabilizing portion. Look at your bare foot. Trace a line from each toe toward your ankle. Notice that the first three toes line up with the ankle bone (talus) and the lower leg (tibia). This is the weight bearing part of your foot. The 4th and 5th toes are to the side and join your heel bone (calcaneous). They are for landing and balancing. When your foot is curled inside your boot your weight rests on the stabilizing part of the foot instead of instead of the weight bearing part. To feel what this carefully stand with your 4th and 5th toe curled under. Notice the strain on the outside of your leg. Do the opposite by extending your toes fully and rolling onto the edge of your big toe. This would be turning the sole of your boot out when you ride. Now all your weight is to the inside of the line. Your foot needs to be flat with toes spread out evenly inside your boot for a solid base of support. To give you a better sense of what you do with your toes experiment with the following idea. Photo 3. Turning the toes out, heel in strains the ankle and causes the lower leg to swing. Practice spreading your toes at home. Gently separate each toe from the next to increase the space between. Take your index finger and trace each toe starting from either end so that you can slide your finger from tip to the base. When you can spread your toes sufficiently interlace your fingers between them. Be gentle! This may be painful and require some practice. As a reminder during the day, place little pieces of cotton between your toes, and walk around. If you have too much material it will be uncomfortable so take a bit out. Put cotton between your toes before you ride. As an experiment only do one foot so you can feel the difference. Notice how secure you are when you have a flat foot and toes spread. Use this Murdoch Minute to improve your base of support and weight your heels. Keeping your toes spread will let the weight bearing part of your foot support you weight while the outside toes help stabilize. And remember to – Enjoy the ride! Photo 4. 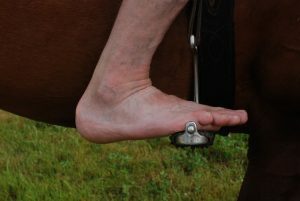 Riding with a flat foot, evenly weighted and toes spread allows the heel to sink down and be properly weighted. 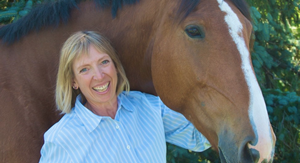 Wendy Murdoch international riding instructor, clinician and author is among the most skillful equestrian teachers encountered today. 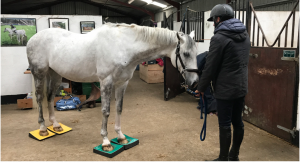 Her keen eye, ability to communicate clear concise information, understanding of correct function for both horse and rider, and hands-on approach to rider solutions makes her teaching immediate, powerful and lasting. Riders make permanent positive changes in minutes under her watchful eye. Her schedule, articles and free video contenct as well as her new book, 40 Five-Minute Jumping Fixes: Simple Solutions for Better Jumping Performance in No Time, can be found at www: murdochmethod.com. Copyright© 20014. All rights reserved.